As I write it is only 12 days until the London Marathon!! I’m excited but am feeling impatient and anxious about getting to the big day feeling well and with no injuries! My foot is still playing up! After my foot hurting a bit after my 11 miles, I thought I’d wait longer than usual before heading out to run again. I did my usual exercise class at work on the Wednesday, which consisted of lots of kettle bell stuff. I then went out on Thursday to do 5 miles. The first 3 were fine, but after that my foot hurt. Not loads, I could just tell that it wasn’t 100%. I’ve come to the conclusion that I need to properly rest it for a decent amount of time, so no running until Saturday, when I’m going to attempt a steady 3 miles. Providing there are no niggles on Saturday, I’ll probably do a couple more short runs next week, but I suspect that these are more for my mental fitness than physical fitness!! I’ve been conscious about trying to keep my fitness up, so I did a high intensity cardio class at the gym on Sunday. Part way through I panicked, I’m not sure this could actually be termed ‘resting’! I enjoyed it though and was really happy that I had no issues with the foot before or after – phew! I did have a mishap with a shard of glass in our garage, which decided to embed itself into my poorly foot! As Simon pulled it out with tweezers, I had a bit of a melt down! I’m not sure my nerves will survive the next couple of weeks! I’m trying to eat well, mainly to stave off any illnesses, but I’ve managed to lose another lb, which is a bonus! I’m also taking Berocca, Iron and Green Tea Supplements to give my immune system a boost. I’m not is probably not necessary, but I’m not leaving anything to chance!! As I’m turning into a marathon bore, I decided to buy a running related book to occupy myself. 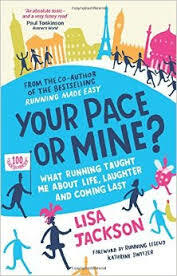 After browsing a few, I decided to go with ‘Your Pace or Mine’ by Lisa Jackson, which is just amazing. Lisa is truly inspirational and isn’t afraid to finish last. I’m finding the book really motivating and inspiring and would advice anyone who is interested in running to read it. We found out today that the hotel we’re staying in for the marathon The Hilton Canary Wharf has upgraded us – thank you very much Hilton! Talk about fantastic timing! If I deserve a nice hotel room – this occasion is certainly it! All in all I’m feeling pretty good. It would’ve been better without my foot being awkward, but that’s just the way it is. I will complete the London Marathon regardless and crossing that finish line is going to be one of the most memorable and sweetest experiences of my life!